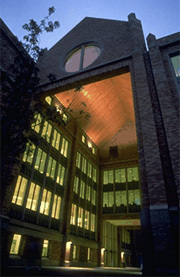 Four students from New Zealand's University of Auckland Business School cruised to victory at the University of Washington Business School's Global Business Challenge on April 17, 2004. The win was the first for a team representing Australasia in the competition's six-year history. The other three finalists were Georgetown University, Hong Kong University of Science and Technology, and Thammasat University of Thailand. Sixteen university teams traveled from across the United States, Asia, Europe, New Zealand, Latin America and Canada to compete. The visiting undergraduates arrived in Seattle on April 12, 2004. After touring Seattle and area companies, the teams received a strategic business problem currently faced by CyberSpeed Technologies, inventors of the MotoCam, a safety accessory for motorcycles that eliminates blind spots. Founded by UW graduates who won $25,000 in the UW's 2003 business plan competition, CyberSpeed originally planned to expand domestically, and competitors in this year's Global Business Challenge had just 48 hours to determine how and if the company should alter its growth strategy to pursue international market opportunities. Tim Ennis, CyberSpeed's president and one of the event's judges, said all teams showed depth and understanding of the company. "The amount and quality of analysis displayed by the students in just a short amount of time was truly impressive," said Ennis. "They presented some extremely creative and applicable ideas that our company can implement immediately. The University of Auckland students were especially adept at recognizing the constraints of a small startup company and showed they really understood what motivates us as individuals to want to succeed." The winning team — composed of Eesvan Krishnan, Nicole Roughan, Alexander Rogers and Lyall Taylor — carefully analyzed CyberSpeed's financials statements and marketing plans. The students concluded that partnering with an original equipment manufacturer would be CyberSpeed's ticket to future success. The competition's 26 judges included executives from Boeing Co., Ford Motor Co., Getty Images, Starbucks Co., and Vulcan Capital. Teams were judged on quality, creativity, and professionalism in presenting their analyses of the business problem. Other competitors were from South Korea, Brazil, Bulgaria, Canada, China, Denmark, France, Germany, Italy, Singapore, Thailand, and three American business schools including the UW. Sponsors included Boeing, ConocoPhillips, Costco, Expeditors, Ford Motor Co., Microsoft, Starbucks, and Washington First International Bank. 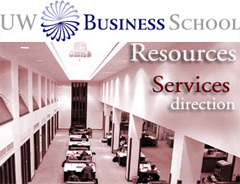 The Global Business Challenge is produced and supported each spring by the school's Global Business Center and students in the Certificate of International Studies in Business program. Last year's winning team from Seoul National University created an international expansion strategy for Starbucks Coffee Co. Since its inception six years ago, 58 business schools from 32 countries and 11 states have participated.